This Rose Almond Butter Cake has a tight crumb and rich buttery flavor without being too sweet. 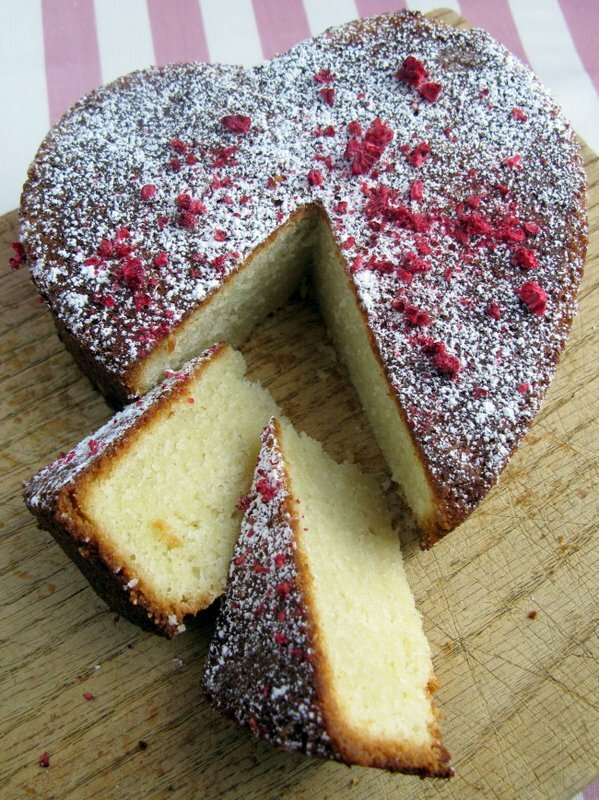 Rose powder in the batter along with orange flower water and a garnish of freeze-dried raspberries give the cake its subtle floral notes. The batter includes blanched almond flour, one of my secret ingredients, as well as cake flour. When I open my next bakery, this will be my signature cake. Almond flour does not absorb liquid as readily or as completely as wheat flour. Cakes made with almond flour alone can be dense and soggy if the rest of the recipe is not adjusted. Here additional eggs does the trick. You’d be surprised how many adept home cooks make a critical mistake. They boldly swap almond flour one-to-one for wheat flour in cake and cookie recipes then are perplexed by the results. (And poorer too.) Almond “flour” refers to the appearance and texture of the product not its constituent ingredient. Caramelization on the crust of any bread or cake sends flavor into the crumb. That is why a pale loaf of bread will be bland and tasteless. My oven has been running a little hot lately, hence the somewhat dark and thick crust. Next time I will watch the temperature more carefully to make the crust slightly less prominent. 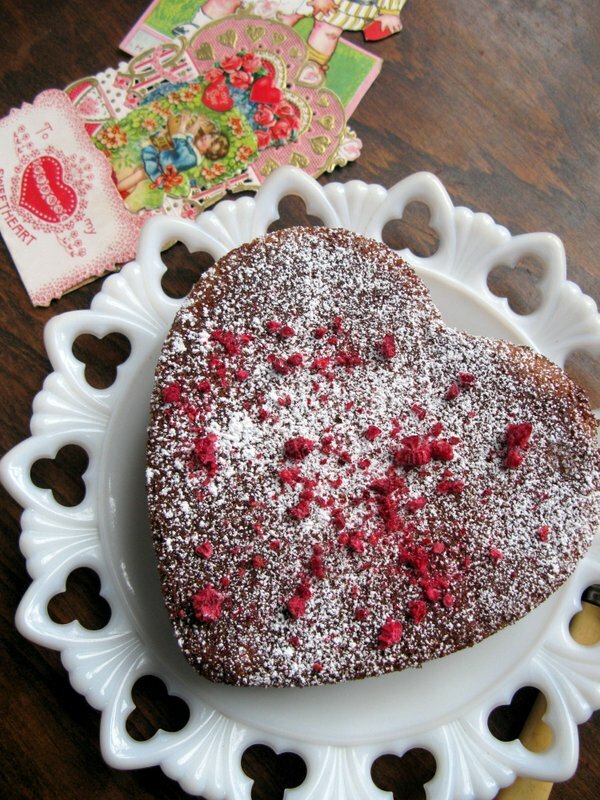 Baked in sweet, heart-shaped pans, rose almond butter cake is the ideal gift for Valentine’s Day. (My Mom has asked me to make some for her neighbors.) You can easily bake it in a loaf pan however. Pâtissiers as well as those who cook Indian, Middle Eastern, North African and Persian cuisines use rose power to add an exotic flavor to their creations. I purchased the powder, made from fragrant damask roses, from Thiercelin. They have been saffron merchants for over 200 years and sell spices to the foodservice trade in France. Their enchanting shop- Gourmanyat, 3 rue Charles-François Dupuis, Paris 3e- is worth the detour to the edge of the Marais district. I found a few purveyors of rose powder on line and more that sell organic dried rose petals for flavoring. (Another suggestion I recently received is to look for quality organic rose petals in a tea shop.) You could pulverize the petals in a small food processor. But without sampling the online products, I cannot make a recommendation of any specific source. My best advice is to substitute an extra teaspoon of rose flower water, grated citrus rind, Bourbon vanilla or vanilla sugar. The last three will change the flavor profile of the cake and perhaps make it more distinctly your own. Preheat the oven to 350°F. Generously butter and flour two 7-inch heart-shaped cake pans or one 9 x 5-inch loaf pan. 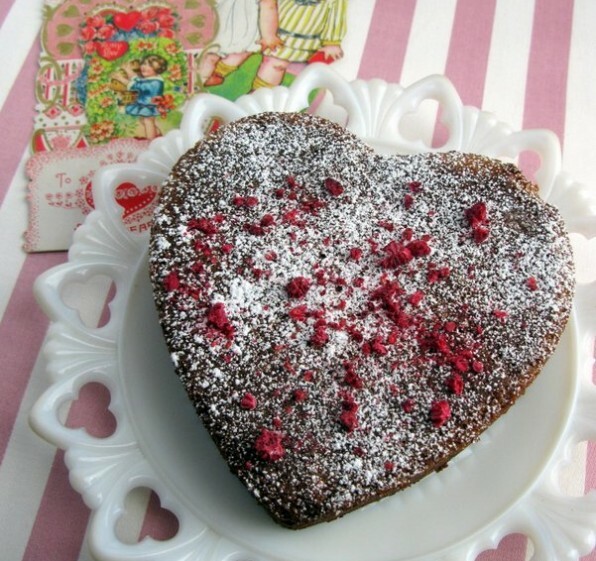 Whisk together the almond flour, cake flour, baking powder, rose petal powder, if using, and salt. Cream the butter in the bowl of a mixer fitted with the paddle attachment until softened. Scrape down the bowl and add the sugar. Beat on medium high speed until the butter is fluffy and aerated, for approximately 3 to 4 minutes. Stir in rose and orange flower waters. Add the eggs, one at a time, beating for 1 to 2 minutes after each egg is added. Scrape the bowl then add the milk alternating with the flour in three additions ending with the flour. Scrape the bowl and beat well each time you add more of each ingredient. Divide the batter evenly between the two pans, approximately 1 pound of batter per pan. Press the batter into the pan with an offset spatula to compress any gaps in the batter. Bake until a cake tester comes out clean, for approximately 40 to 45 minutes. Cool the cakes in their pans on a cooling rack for five minutes. Run a flat knife or offset spatula around the edge to loosen the cakes. Then invert each one onto the cooling rack. Remove the pans and let them cool completely. When ready to serve, dust the cakes with powdered sugar and more rose petal powder, if using then scatter crushed freeze-dried raspberries over the tops. Rose power is an exotic ingredient used by pâtissiers as well as those who cook Indian, Middle Eastern, North African and Persian cuisines. I purchased the powder, made from fragrant damask roses, on a trip to Paris from Thiercelin. They have been saffron merchants for over 200 years and sell spices to the foodservice trade. Their enchanting shop Gourmanyat, 3 rue Charles-François Dupuis, Paris 3e, is worth the detour to the edge of the Marais district. I found a few purveyors of rose powder on line and more that sell organic dried rose petals for flavoring. You could pulverize the petals in a small food processor. Without sampling these products, I cannot make a recommendation of any specific source. My best advice is to substitute a teaspoon of rose flower water, grated citrus rind, Bourbon vanilla or vanilla sugar. The last three will change the flavor profile of the cake and perhaps make it more distinctly your own. Freeze-dried raspberries are available at health food stores such as Foodworks in Old Saybrook, CT.